Click here to make your concrete problem go away fast. Concrete removal and concrete disposal does not have to be overwhelming. You have taken the Step One, choosing Rock Hammer Demolition to make your concrete project quick and easy. Concrete removal, concrete breaking, concrete disposal… it’s what we do. Rock Hammer Demolition has the equipment, experience and people to remove concrete and masonry structures, surfaces, roads, walls… anything. 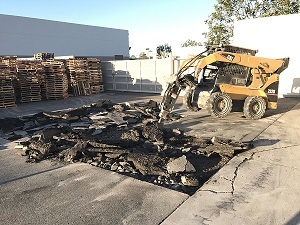 In Southern California – Orange County, Riverside County, San Bernardino County and Los Angeles County – we are known as the responsible source for concrete removal and concrete disposal. Need a 2000-pound breaker hammer? We’ve got it. And everything else, too. Our 35 years of combined experience has taught us to be prepared for any concrete removal job. That means having the correct tools for the project. 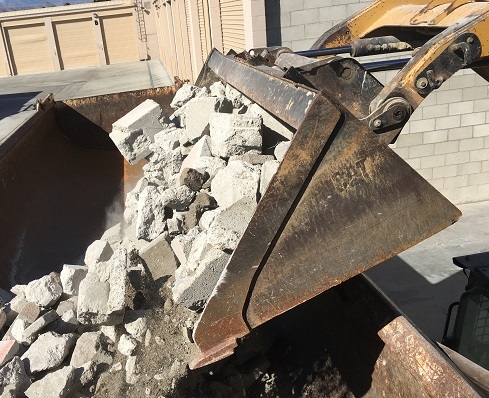 Small to large excavators and a modern, professionally maintained fleet of dump trucks for concrete disposal – all up to current California environmental and emissions standards – are waiting for your call. It just takes one call to remove the largest problem most home owners and businesses ever face – how to dispose of tons of concrete, masonry and asphalt. We break down the structure, remove the debris, haul it away for safe, legal disposal. No worries and no hassles. We understand that you expect a clean, safe, compliant work flow. We respect your property and your vision and will enhance it with our professional, dedicated staff of experienced tradespeople. Time to take Step Two – call now for your free estimate. Our 24/7/365 approach is based on an understanding that sometimes a project simply can’t wait until morning light. That’s why we’re ready for you when you need us. One call is all it takes to set up your concrete removal or concrete disposal project. Call us click here and we will call you right away.